The sphenopalatine ganglion block is a widely utilized treatment for headache pain, atypical face pain, neuralgias, and various sympathetically maintained pain conditions. 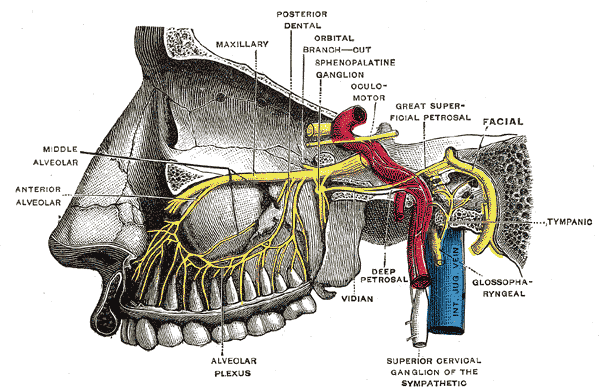 The sphenopalatine ganglion is a bundle of nerves located below the nose, within the pterygopalatine fossa bone cavity, and is linked to the sensory, parasympathetic, and sympathetic nervous systems. This bundle of nerves has been the primary target of treatment for the relief of headache pain for over a century. Originating in 1908, this treatment initially began by using cocaine or alcohol (which was applied to the region using cotton soaked in the anesthetic) to achieve a blocking of the nerves that make up the sphenopalatine ganglion, therefore interfering with the transmission of pain signals and providing relief from severe nasal headache pain. Currently, the sphenopalatine ganglion block remains a widely utilized intervention for the treatment of cluster headaches, migraines, and atypical face pain. How is a Sphenopalatine Ganglion Block Performed? The sphenopalatine ganglion block is a relatively quick, minimally invasive procedure that can be completed in an outpatient setting. This treatment includes anesthetizing the nerve bundles within the sphenopalatine ganglion, thereby preventing or “blocking” the nerves from transmitting information regarding pain sensations to the brain. There are several methods by which physicians are able to anesthetize the sphenopalatine ganglion bundle of nerves, which include the transnasal, transoral, and lateral approach. The most common, and quickest, method is the transnasal approach. This procedure involves applying a local anesthetic directly to the mucous membranes within the nasal cavity. For this procedure, the patient is generally lying on their back with their nose pointed vertically toward the ceiling. A local anesthetic (4% lidocaine) is then applied to the lateral wall of the nasal cavity directly above the nerve bundle using a long, cotton-tipped applicator. Watch a Sphenopalatine Ganglion Block – Performed Live! The application is generally allowed to remain in position for approximately 20 to 30 minutes to allow for absorption. Afterward, the physician will monitor the patient’s pain severity and repeat the application until the patient has achieved relief. Alternatively, the anesthetic can be administered without the applicator. 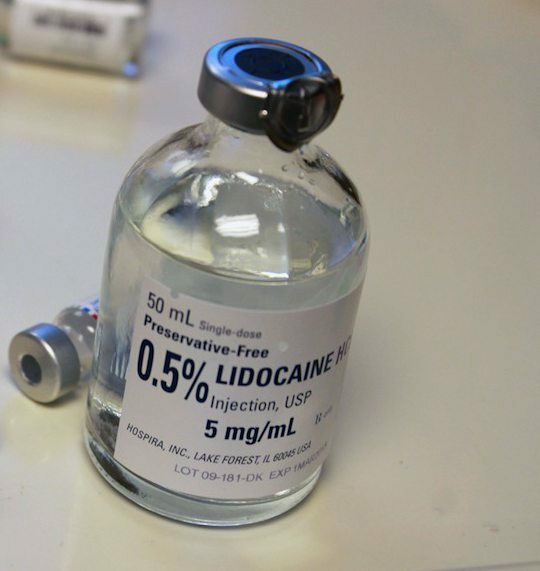 For this, typically a 2% viscous lidocaine solution is chosen. Similar to the transnasal approach, the patient is asked to lie on their back with the tip of their nose pointed vertically. The solution is inserted into the nasal passageway and the patient is asked to inhale quickly. The third method of application, the intraoral technique, is achieved using a very small dental needle. For this, the physician will locate the appropriate location for insertion by palpating the patient’s gum line. Once the proper position is located the physician inserts the needle and injects the local anesthetic. Generally, patients experience pain relief within approximately 15 to 30 minutes. 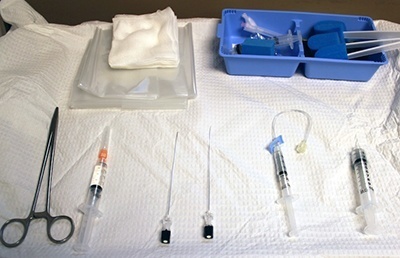 Patients may be sedated during the procedure, depending on which technique is used, in order to ensure that the patient is comfortable. Once the procedure is completed, the patient is monitored for adverse reactions. The sphenopalatine ganglion block can be performed using various techniques, which are minimally invasive and tout very low risk. Further, the effectiveness of the sphenopalatine ganglion block has been well documented. In a study examining patients almost six years following initial use of the sphenopalatine ganglion block for the treatment of cluster headaches, results indicate that over 60% of patients reported ongoing benefits from this intervention. Interestingly, the sphenopalatine ganglion block has also received empirical support for the relief of pain related to cancer conditions. The sphenopalatine ganglion block has been documented as effective in reducing or relieving pain associated with cluster headaches, migraines, and atypical face pain. Previous literature has established that this procedure is most beneficial for conditions with parasympathetic features. Moreover, the sphenopalatine ganglion block is the ideal treatment of choice for those who experience adverse reactions to medication or whose pain symptoms have been nonresponsive to numerous trials of medication. The sphenopalatine ganglion block is a minimally invasive, non-surgical treatment option for individuals suffering from headache pain, migraines, or atypical face pain. This treatment option is particularly helpful to those patients whose pain has largely been unresponsive to other medication treatments or who experience significant side effects from typical pain medication. This procedure involves a relatively low risk and its pain-relieving effects can be experienced immediately. For individuals whose pain does not respond right away to the intervention, effects can be felt following a few repeat interventions. Cho DY, Drover DR, Nekhendzy V, Butwick AJ, Collins J, Hwang PH. The effectiveness of preemptive sphenopalative ganglion block on postoperative pain and functional outcomes after functional endoscopic sinus surgery. Int Forum Allery Rhino. 2011;1(3):212-8. DeMaria S Jr, Govindaraj S, Chinosorvatana N, Kang S, Levine AI. Bilateral sphenopalatine ganglion blockade improves postoperative analgesia after endoscopic sinus surgery. Am J Rhinol Allergy. 2012;26(1):E23-7. Ferrante FM, Kaufman AG, Dunbar SA, et al. Sphenopalatine ganglion block for the treatment of myofascial pain of the head, neck, and shoulders. Reg Anesth Pain Med. 1998;23(1):30-36. Leong MS, Gjolaij MP, Gaeta RR. Sphenopalatine Ganglion Block. Comprehensive Treatment of Chronic Pain by Medical, Interventional, and Integrative Approaches. 2013, pp. 303-307. Levin M. Nerve blocks in the treatment of headache. Neurotherapeutics. 2010; 7(2):197-203. Levin M. Nerve blocks and nerve stimulation in headache disorders. Tech Reg Anesthesia & Pain Management. 2009;13:42-49. Nguyen M, Wilkes D, Pulsed radiofrequency V2 treatment and intranasal sphenopalatine ganglion block: A combination therapy for atypical trigeminal neuralgia. Pain Pract. 2010;10(4):370-374.